Sergeant Lea R. Mills was born on July 1, 1984 in Brooksville Florida. He joined the United States Marine Corps on September 11, 2002 at MCRD Paris Island and continued his MOS training at the Assault Amphibian Schools Battalion at Camp Pendleton, California. He was meritoriously promoted to the rank of Lance Corporal after graduating first in his Basic Vehicle Repairman class. While Sergeant Mills was assigned as a 2141 to Combat Assault Battalion, he was meritoriously promoted to the rank of Corporal. After his tour in Okinawa, Sgt Mills went to Third Assault Amphibian Battalion where he preformed his duties as an Assault Amphibious Vehicle Mechanic. Sgt Mills came to First Platoon, Charlie Company in September 2005 and deployed to Operation IRAQI FREEDOM in support of America’s Battalion- 3D Battalion, 3D Marines where he was killed in action on 28 April 2006. His awards include the Purple Heart, the Marine Corps Good Conduct Medal, the National Defense Service Medal, the Iraqi Campaign Medal, the Global War on Terrorism Service Medal, the Combat Action Ribbon, and the Sea Service Deployment Ribbon. He is survived by his wife, his parents, and his brother. MASARYKTOWN — It never gets any easier. But for Dee Mills, the call to speak about her son, Marine Sgt. Lea Mills, and others who have died like him, is always worthwhile. On Saturday morning, Mills and her husband, Rob, along with about 100 people, dedicated a new road to their son. Rep. Ginny Brown-Waite, along with Hernando County officials and the Patriot Guard Riders, also attended the event. The 21-year-old sergeant was killed in April 2006 when a roadside bomb went off next to his Humvee in the Al Anbar province of Iraq. A Hernando High graduate, he had been in Iraq just six weeks. The road connects U.S. 41 with Corporate Boulevard, within Corporate AirPark. It is part of a planned network of roads that will improve accessibility for the businesses within the airport to other major roadways such as Spring Hill Drive and Anderson Snow and County Line roads. In November, the Brooksville Aviation Branch Post Office was also renamed the Sgt. Lea Robert Mills Post Office. As Mills spoke Saturday, Larry Decker stood in the crowd next his daughter, Cheyanne, and wiped away tears. His stepson, Army Spc. Cody Grater, died last July while serving in Iraq. Grater was at the halfway point of his 14-month tour of duty and had just been home in Spring Hill on leave before going back to Iraq, where he was killed a little more than a week later. Both of them came to Saturday’s dedication wearing T-shirts with pictures of Grater in uniform. Along with many friends, the family plans to celebrate his 21st birthday today at his grave in the Florida National Cemetery. After the short ceremony, the Mills climbed onto their son’s motorcycle. They led the group of riders and drivers on a commemorative trip down the newly minted road. LAKELAND — More than a thousand people packed Calvary Baptist Church in Lakeland on Sunday to honor war veterans, past and present. Calvary Baptist Church in Lakeland’s 12th Annual Memorial Day special service paid tribute on this Memorial Day weekend to veterans of the Korean War and the Iraq War. Keynote speaker Sheriff Grady Judd talked about the importance of the U.S. military protecting religious freedom. “If we fail to stand up and speak out against atrocities, we, too, can have a barbaric country, and like sheep be led to the slaughter,” Judd said. The service also honored veterans with Florida ties. One of those was Marine Sgt. Lea Mills of Hernando County. 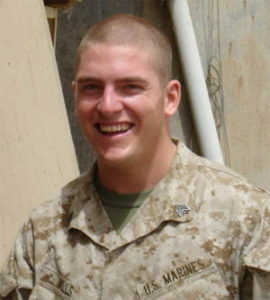 Mills was killed on April 28, 2006 while serving in Iraq. He was 21 years old. Mills’ parents said their son died doing what he loved. “He took another man’s place the day he was killed,” said Mills’ mother, Dee. “Ten years goes by, but there’s not a day that we don’t think about him,” said Mills’ father, Vietnam War veteran Rob Mills. The service included a final roll call, and a letter Dee Mills wrote about her son, read by Marine Pfc. Aubry Skelton, son of Calvary Baptist’s pastor, Shane Skelton. Dee Mills said the service was bittersweet. “It’s sweet because he so deserves the honor. He gave his all,” Dee said. Mills’ parents also expressed hope that Judd’s message might serve as a reminder of the purpose of Memorial Day, a holiday designated for honoring those who died while serving in the U.S. armed forces.